During research on the Ballinrobe Workhouse I found a reference to 'best potatoes' - Cups and Peelers - being supplied to the workhouse at 4 pennies (sterling) a stone in September 1842. 'Lumpers' however, costing 2 and a quarter old pennies a stone, were by far the larger amount supplied. The better quality 'cups' and 'peelers' would have been purchased for the meals of the Master, Matron, Clerk, Schoolmaster and Mistress, the Porter and other staff entitled to better class 'rations'. These lumper potatoes, upon which the poorer Irish depended, were to contribute to the tragic events that were shortly to occur shortly during the Famine. An interesting article on Lumpar Potatoes titled "The Lumper Potato and the Famine" was written by Cormac Ó Gráda (associate professor of economics at University College, Dublin) and printed in the first volume of History Ireland. Several recent contributions to pre-famine Irish economic history have drawn attention to the apparent contrast between the abject poverty of the Irish masses and their relatively high nutritional status. Poverty, they argue, was mitigated by a potato-dominated diet which, while monotonous, was adequate in terms of calories and protein. Modern nutritional analysis indeed concedes that potatoes are good food - according to one well-known account ‘the potato is the only single cheap food that can support human life when fed as the sole article of diet’. But this raises a question-mark about the potato, since the potatoes consumed in pre-famine Ireland differ from those common today. The poor reputation of the kind most closely linked to the Famine, the notorious Lumper, makes the question all the more apposite. Thus, in assessing calorie intake before the Famine, knowing the acreage under potatoes and the average yield per acre is not enough: potato quality is also important. In 1810 the Cork agriculturist Horatio Townsend noted that Irish potatoes were ‘pleasant, mealy, and nourishing’ compared to the ‘watery and ill-flavoured’ varieties prevalent in England. Potato quality declined in Ireland thereafter, however, and on the eve of the Famine the very poor were often forced to rely almost exclusively on inferior varieties, notably the Lumper. Thus in 1832 a Kerry campaigner against tithes complained of ‘gan do bhiadh againn ach lompers agus an nídh nach ar bfiudh leis na ministéirighe d’ithead (our only food being lumpers and what the ministers would not eat)’. When the English radical William Cobbett visited Waterford in 1834, he was told that ‘when men or women are employed, at six-pence a day and their board, to dig Minions or Apple-potatoes, they are not suffered to taste them, but are sent to another field to dig Lumpers to eat’. For the poor, who evidently preferred the premium Apple potato and even the Cup (hardy but coarser than the Apple), the spread of the Lumper indicated impoverishment. It was tasteless, but was it also poor food? The dry matter content (i.e. 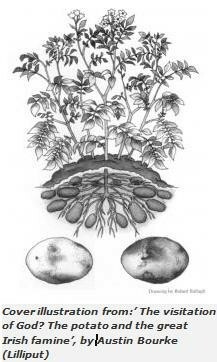 starch) in any crop of potatoes is quite variable: climate, pests, soil and agricultural practices all play a role. Variety is also crucial and, given its poor press, the watery and ungainly Lumper probably contained less dry matter than other cultivated varieties. But did it also contain less than modern varieties ? And how widely was it consumed? We cannot assume that the nutritional quality of pre-Famine foods matched that of modern varieties. The crucial question remains less how the Lumper compared with the Apple, the Cup, or the Minion than how it would rate against modern dry matter estimates. When compared with contemporary supermarket varieties, the Lumper’s weight-loss from cooking, as reported in 1840 - two ounces in every sixteen, was much greater. Thus a labourer’s daily intake of potatoes before the Famine (estimated at between 10 and 14 lbs!) was in reality reduced by the time it was consumed at the dinner table. 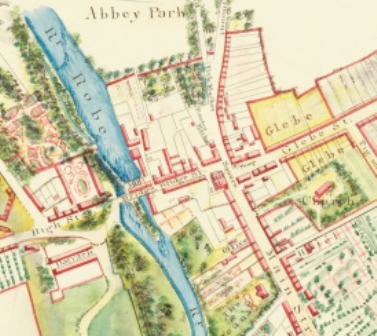 Royal Dublin Society tests in the 1830s of the actual weight (specific gravity) of potato varieties found that the Lumper was the lowest at 1.084. The higher the specific gravity the ‘better’ the potato: potatoes with a specific gravity of one would float in water! A standard conversion produces dry matter estimates of 28, 24 and 21 per cent for the Apple, Cup, and Lumper, respectively. On average, starch content works out at about 80 per cent of the dry matter content. From the statistics, the Lumper’s lowly status is plain. Although the Lumper has not been commercially cultivated for a long time, it was still grown in some districts in the 1920s, and specimens survive in a few ‘museum’ collections in Ireland and Scotland. The Scottish Agriculture and Fishery Department’s scientific services in Edinburgh has a rich collection of such varieties. During 1991, officials there grew a range of modern and ‘museum’ varieties (including the Lumper), and measured their dry matter content and specific gravity. In this experiment, the Lumper performed poorly compared to premium varieties, either modern or ‘museum’, but quite well relative to modern supermarket varieties. Another guide to diffusion is the replies to the centenary inquiry into the Famine in folk memory, carried out by the Irish Folklore Commission in 1945-6, which contain several mentions of varieties found before the Famine. These accounts are not above suspicion, since they sometimes claim for the pre-Famine era post-Famine varieties no longer common or extinct by the 1940s. Moreover, some potato varieties - like some jigs and reels today - may well have been known by different names in different counties. The many names given included Green Tops, White Rocks, and American Sailors (Kerry), White Tops (Carlow), Skerry Blues, Red Scotch Downs or Peelers, and White Scotch Downs (Westmeath), Thistlewhippers and Pink Eyes (Cavan), Prodestans (Mayo), Weavers (Down), Leathers and Mingens (i.e. Minions) (Kerry), Cups, Buns, Millers’ Thumbs, and Derry Bucks (Donegal), and Coipíní (or Cups) (Connemara). The Lumper was mentioned too, though not often. On the whole, the evidence suggests greater variety than allowed for by the historiography. 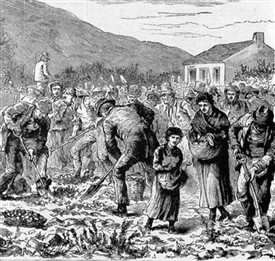 The Lumper is doubly notorious in Irish history, for being poor food in the decades leading up to the Great Famine, and for offering such poor resistance to phytophthera infestans (the blight). Fair enough. And yet, though the Lumper was definitely dull fare, it usually provided the requisite calories before 1845. Moreover, though most historians deem the cottiers who switched to the Lumper to have traded security for large crops, it was originally introduced from Scotland for both sturdiness and yield. 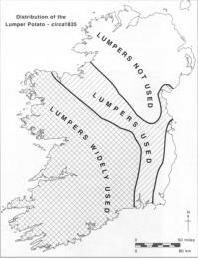 Finally, the Lumper will always be linked to the Great Hunger by its dominance in Ireland by the 1840s: yet it should be remembered that all other varieties commonly sown at the time also succumbed to the blight. Cormac Ó Gráda, The Great Irish Famine (London 1989). Cormac Ó Gráda, Ireland: A New Economic History 1780-1939 (Oxford forthcoming). P.M.A. Bourke, The Visitation of God? (Dublin 1993).